Blue Marble Marine Set of 12 Courtesy and Quarantine Flags for US, Canada, Bermuda, Bahamas and Greater Antilles. 12 X 18 inches, UV fade-resistant. Tired of paying an arm and a leg for courtesy flags that are only used occasionally? Why pay $22 for a single flag? We offer the best value around in courtesy flags. Get the quarantine and courtesy flags set you need without spending a fortune. 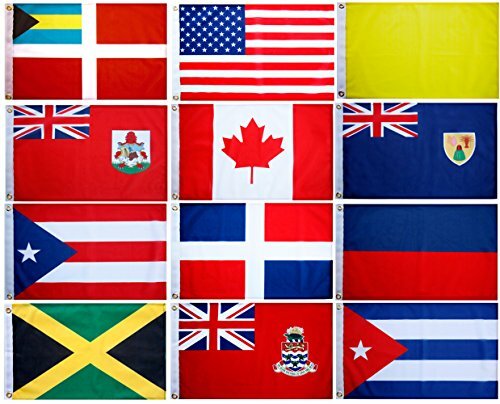 Set of 12 Marine Courtesy and Quarantine Flags for US, Canada, Bermuda, Bahamas and Greater Antilles. This set has you covered from Canada to Puerto Rico, for a fraction of the cost of others. These flags are 12" x 18" in size, made of the best polyester fabric available, resistant to fading and yet are affordable. We get you, we are cruisers too. We help your cruising dollars go further. Show your respect and appreciation for the countries you visit, and avoid fines or harassment. Courtesy flags open doors and make friends. As a matter of courtesy, foreign boats are expected to fly the flag of a foreign nation when entering and operating on its waters. However, courtesy flags are hoisted only after the appropriate authorities have granted clearance. Until clearance is obtained, a boat must fly the yellow Quarantine flag. Use our courtesy flags to display your respect for the country you are visiting. The courtesy flag is flown at the boat's starboard spreader. Note: Some older sets shipped before 6/20/18 included an incorrect version of the Jamaican courtesy flag. If the design includes a large red cross and three white quadrants, you have the incorrect design. Please contact us and we will send you a free replacement. Meets Regulations - 12" by 18" to comply with international protocols. 100% Guarantee - All sets are backed by 100% guarantee. If you're not satisfied we will replace it or refund your purchase. If you have any questions about this product by Blue Marble Marine, contact us by completing and submitting the form below. If you are looking for a specif part number, please include it with your message.